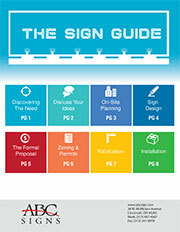 Proper sign installation is as important as the design and manufacturing process. Our experienced and professional crews are ready to handle all of your installation needs. Once your sign is installed, our fully licensed and insured crews will answer any questions you may have about sign maintenance or operation. Please call (513) 407-4367 or email us today! Your satisfaction is guaranteed.